Well hardly but I do try. Not in the Nigella way that her kitchen is alway neet and tidy, as I am the messiest cook in the world but I do enjoy cooking a lot. We have recently had our flat renovated and the piece de resistance has to be our new kitchen. 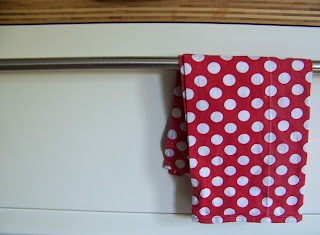 I am a big lover of 50s design and we tried to emulate that kind of look in our kitchen. Cream gloss units, bamboo wooden work surface, travatine tiled splashback and the most gorgeous eau de nile coloured walls. As with all our rooms the main design had to be fairly plain and simple as all my storage pots and nick nacks are very patterned. As you can see I have spots everywhere with the odd touch of stripes and florals. It is all practical but just pretty and over the top too. 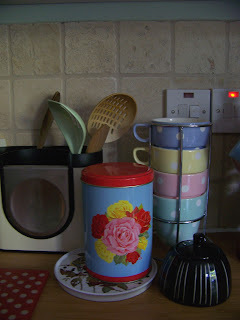 These polka dot mugs from Marks and Spencers are great, not only are they in my favourite pastel colours but they come in there own stackable storage tower and they hold a good big cup of tea. Plus the top is wide so they are great for dunking the odd digestive or two. I do like a bargain and the last and next picture show some of my best. 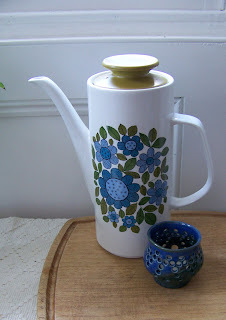 My £5 60s floral coffee pot, its such a great pattern, along with a tealight holder left for me from my lovely friend Sini when she moved away. 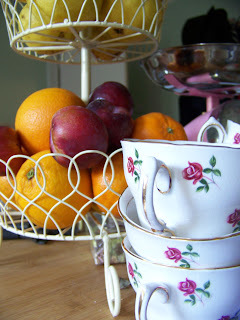 Below is my £4.50 cupcake stand, or as I use it fruit stand from a DIY store, sitting next to another charity shop find these beautiful old rose teacups, the saucers and just out of shot. You can also just about make out my pink weighing scales behind which were a present from my lovely boyfriend. He also got me the most amazing cream enamelled pan set for christmas. So even though I may not be the tidiest girl around I do try to make my home a nice place to be. Plus I do make a mean cheesecake so I can't be all that bad.